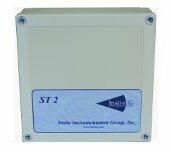 The Insite Instrumentation Group Model 20 (M-20) dissolved oxygen sensor is a unique product that combines advanced electronics with solid-state, optical sensing technology. The sensor is based on the field proven design of the Model 10 family of sensors with over 8,000 units shipped. To this proven design, the Model 20 adds the ability to mount the sensors throughout the plant without having to deal with running conduit between the sensor and analyzer. This allows for significant savings on installation costs while also allowing maximum flexibility in sensor placement. No other dissolved oxygen sensor can compare with the features and benefits of this revolutionary design. The M-20 sensor connects to a Sensor Transmitter (ST 2) junction box. The ST 2 then communicates with the Process Transmitter (PT 2) via a ZigBee compliant Rf module. 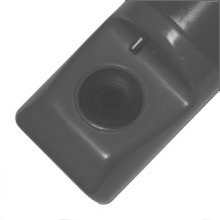 There is an embedded antenna which provides an outdoor line of sight range up to one mile. When several ST 2 / Sensor pairs are installed they form a self-healing mesh network that increases reliability. The M-20 Sensor is our standard fluorescence dissolved oxygen sensor configuration. This includes the 1-1/2" NPT male mounting thread, 1/4" quick connect tube fitting for the integrated jet clean, and 33ft (10m) of sensor communications cable. Additional cable length is available upon request. The M-20PI Sensor is intended for inline monitoring in a large diameter pipe. The mount is 2" NPT male thread in 316 stainless steel that works with a customer supplied 2" Thread-O-Let. 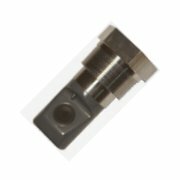 The integrated jet clean with this sensor includes an inline check valve. There is a flow indication groove on the back of the sensor mount that should be parallel with the flow. There is a flow indication groove on the back of the sensor mount that should be parallel with the flow. Maximum in-line pressure is 20 psi. See the 20 Series System Manual manual for additional information. The M-20T Sensor is intended for inline dissolved oxygen monitoring utilizing a by-pass loop. The by-pass loop is generally configured using customer supplied full port ball valves on both sides of the tee. The supplied tee (as shown) is 3" schedule 80 PVC, with slip connections for process piping and a 2" female NPT connection for the DO probe. 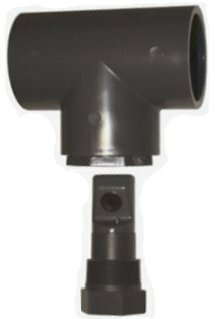 The integrated jet clean with this sensor includes an inline check valve. There is a flow indication groove on the back of the sensor mount that should be parallel with the flow. Maximum in-line pressure is 20 psi. See the 20 Series System Manual manual for additional information. The M-20HT Sensor combines the ease of use of a hot tap mount with the reliability of the InsiteIG DO Sensor. The mount is a 2" NPT male thread in 316 stainless steel that works with a customer supplied 2" Thread-O-Let, saddle or existing piping. The integrated jet clean includes an inline check valve. Maximum in-line pressure is 40 psi.